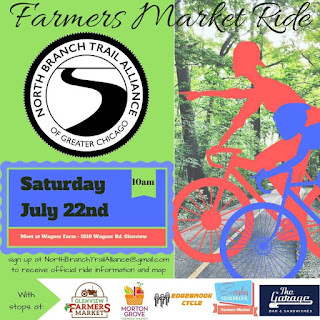 invites you to our second ride - The Farmers Markers of the North Branch Trail ! This ride will start at 10 AM at the Historic Wagner Farm in Glenview - site of the Glenview Farmers market. You are welcome to arrive earlier and explore the market (it opens at 9 AM). We will then proceed to the Morton Grove Farmers market, which is offering the riders free water and 1$ discount coupon. From there we will move to the Edgebrook Farmers Market. Riders will be introduced to Edgebrook Cycle - one of the NBT Alliance Partners in downtown Edgebrook. Finally, the ride will finish up at The Garage Bar in Gladstone Park. Riders are invited to stay at The Garage and socialize. Ride resumes from Edgebrook at about Noon. We kindly encourage you to patronize the NBT Alliance business partners, so bring some spending money with you and show some love on Social Media. If you would like to volunteer at this or a future NBTA ride, we would love to hear from you!